Spray large saucepan with nonstick cooking spray; heat over medium heat. Add green onions and garlic; cook and stir 3 minutes or until green onions are tender. Stir broth, lemon peel, and pepper into saucepan; bring to a boil over high heat. 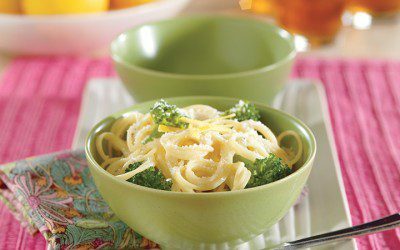 Stir in broccoli and pasta; return to a boil. Reduce heat to low. Simmer, uncovered, 6 to 7 minutes or until pasta is tender, stirring frequently. Remove from heat. Stir in yogurt until well blended. Let stand 5 minutes. Top with cheese before serving. Garnish as desired. Exchanges per serving: 1 Bread/Starch, 1 Vegetable.